The products absorb free carbon, gelatinous substance by macromolecule to reduce the cost and advance product quality. It is used for treating the unqualified turbine oil, especially the seriously emulsified turbine oil. This products, which can rapidly and effectively remove the water, gas and impurities, aim at turbine oils nature of high water content, easy emulsifiable and high impurity content, and make the oil recover the new oils nature. 1 The capacities of dehydration and degas are great, and assure of eliminating kinds of gas. 2 To absorb free carbon, gelatinous substance by macromolecule to reduce the cost and advance product quality. 4 Breaking emulsification thoroughly with high- molecule polymeric material. 5 Dewatering very effectively with once and for two steps dehydrating method. It can thoroughly clear away the liquid water, free water and 80% dissolved water. 6 With distinctive removing impurities technique filtering through double FH trapezoidal network and absorbing by high polymer material, this machine can make the ß3 equal or surpass 200 and make the cleanness lower grade 6(NAS1638). 7 With the trapezoidal, spiral, automatic back flushing system. 8 With the advanced dielectric condensation devices. 9 On-line oil purification can be carried out with turbine or water turbine automatically without any person. The capacities of dehydration and degas are great, and assure of eliminating kinds of gas. 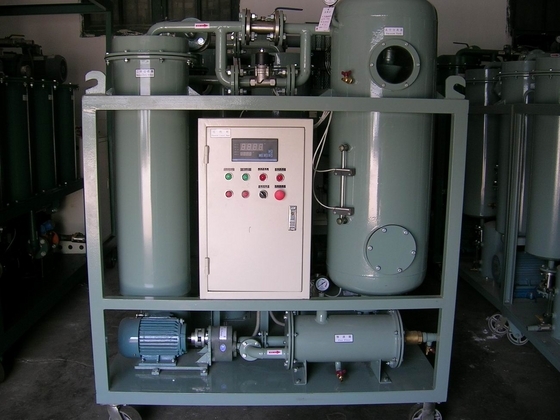 This machine breaks emulsification thoroughly, and the oil is very difficult to emulsify again after treatment. Its dehydration volume is large and it can absorb water on line. TY-R series, which prevent lubrication system from damage, can effectively extend the lifetime of oil and protect turbine and other machinery.